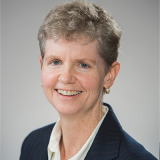 Jane Powers, MSW, LICSW, is the Acting CEO at Fenway Health. She oversees a staff of more than 70 therapists, social workers, addictions specialists, and LGBT violence prevention experts. Jane has a clinical background in child, adolescent, and family therapy; she now works with clients of all age groups. In 2016-17, Jane was part of a 5 person faculty in a year-long national ECHO online learning community, Transforming LGBT Health in Primary Care.